Our West Liberty & Muscatine, IA dental offices strive to make it easy for every member of your family to receive the high-quality dental health care you’ll need at every stage of life. The team here at Gentle Family Dentists is particularly proud of our pediatric dentistry services. That’s why, today, we’ve decided to post a few ideas for you to incorporate into your children’s oral hygiene routine. Keep reading, then be sure to call us at 563-288-2612 to request your next family dentistry appointment. It is never too early to start good habits. Even before there are teeth, your child’s mouth will have dangerous bacteria lurking throughout. Plus, any size teeth can get cavities, so you really will need to worry about oral hygiene as soon as the teeth pop through. So, when is the acceptable time for that initial trip to the dentist? 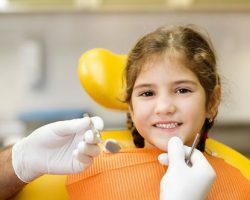 Our team recommends that parents bring their children to the dentist before the age of one. The American Dental Association concurs. Obviously we will want to make sure your child’s teeth and gums are healthy and developing in the proper way. But we also want them to be comfortable in a dental office and at ease with any necessary treatment. Dental anxiety and fear of the dentist is usually the result of being afraid of the unknown, or it stems from lack of positive dental experiences to serve as a reference point later on when the stakes are higher. While you are with us, we’ll help you figure out the best way to brush their teeth and we’ll also start them on a program of prevention, which includes fluoride treatments and dental sealants (if you request them) to reduce the omnipresent risk of tooth decay and gum disease. Around here we’d rather be educating your children and preventing bigger issues along the way rather than scheduling restorative solutions later that are more invasive and costly for everyone involved. Your visits to our office are super-important. We definitely expect to see your smiling faces in our dental chairs every 3-6 months. That said, most of the ongoing work happens at home. Accordingly, your kids will need to be instructed on good oral health maintenance practices. As with adults, we suggest that children brush their teeth twice a day and get in the habit of flossing as early as possible. Since parents consistently report that it is a daily struggle to get their children to do these things, you might want to create a new routine. Here are a couple ideas to think about. Many parents in our network regularly brush along with their children and even let their younger children brush their (as in the parents) teeth. This will set a good example but also allow for a playful encounter over the sink. We all need a little positive reinforcement in our lives but this is especially true of youngsters. For brushing and flossing properly, you can give your children simple rewards like stickers or maybe tie these activities to getting a little extra screen time. Call Gentle Family Dentists at 563-288-2612 or use our online form to request an appointment for family dentistry solutions in our Muscatine or West Liberty, IA dental office. We can’t wait to get started!